"Golf Course/ 100 acres Prime Land"
Cornerstone Golf Club closed its full course at the end of the 2018 season. Mini Putt, Driving Range, select golf hole maintenance will take place for 2019 season. Restaurant, pro shop & lower level recently renovated. Opportunity to continue 9/18 Hole Hybrid Golf Course or great location for other potential development including possible campground. 2000 sq.ft. Clubhouse facility included pro shop, fully equipped commercial kitchen, restaurant & bar with seating for 55 inside and another 55 outside on large 1,000 sq. ft. partially covered deck for golf and restaurant patrons (licenced for 140). 1000 sq.ft. Lower level provides, prep kitchen, 2 large storage rooms, laundry, 4 pc bath, residential suite. 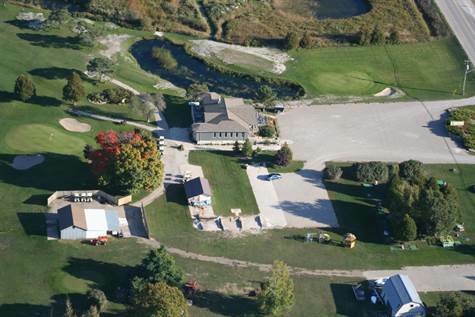 Large outbuilding for member club storage; large maintenance building; Sale includes mini golf and driving range; 100 acres of prime land, 5 ponds, 4 of which supply water for irrigation.